This article is a short summary of Mario Tennis: Ultra Smash. Mario Tennis: Ultra Smash is a Wii U installment in the Mario Tennis series, released in 2015. Unleash your jump shots to take the advantage! Use jump shots to leap into the air and return the ball with extra power. In Mega Battle mode, grab a Mega Mushroom to boost your size and turn the game around! Play a Doubles match with your amiibo! Playing along side your amiibo figure will improve their stats and earn them new skills. Challenge players from around the world in Online mode! Most of the gameplay from past Mario Tennis games returns here. Elements such as Chance Shots from Mario Tennis Open return, while Jumpshots make an appearance as a new type of move. A new gameplay mode, "Mega Battles", has also been confirmed to appear, in which players can grab Mega Mushrooms to become giant, though regular tennis matches are also available. One or two players can also play online against other players. By scanning an amiibo into the game, the player can play alongside or against them as a computer opponent, similar to Super Smash Bros. for Nintendo 3DS and Wii U, which increases their stats. ↑ Star Fox Zero, Mario Maker Wii U Bundle Release Dates Announced. GameSpot (August 24, 2015). Retrieved August 24, 2015. 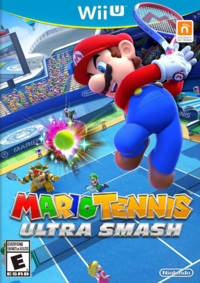 ↑ Mario Tennis: Ultra Smash file size. Nintendo Everything (November 1, 2015). Retrieved November 5, 2015. This page was last edited on 11 January 2018, at 19:39.